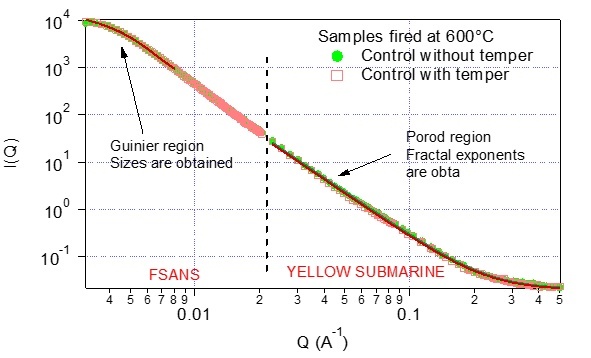 The FSANS diffractometer covers a Q-range of 0.0003 to 0.03 Å-1, a range complementary to the Yellow Submarine SANS instrument, allowing to probe structures at corresponding length scales of 100 to 5000 Å. It has a wide range of applications from studies of defects and precipitates in materials, alloy segregations, surfactant and colloid solutions, polymers, proteins, biological membranes, ferromagnetics, magnetic correlations. 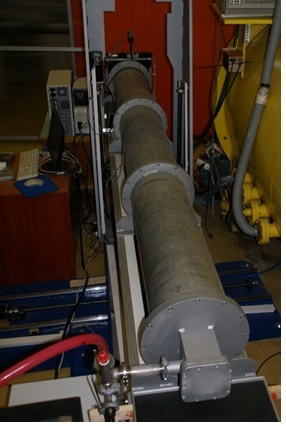 The instrument is installed on the bottom section of the curved neutron guide No.10/3, made of m = 2 supermirrors. Figure 1. Flight tube and detector positioning mechanism of the FSANS diffractometer downstream of the sample position. The beam time structure is provided by 4 choppers: a counter-rotating pair of pulse definition choppers, one wavelength limiting and one frame overlap chopper. The available wavelength range is 2 to 16 Å. The the wavelength uncertainty width, Δλ can be set by choosing the pulse definition chopper window to 0.3 Å with a 8° opening (better resolution mode) or 0.75 Å with 20° opening (higher intensity mode), respectively. The collimation and sample to detector distances are 3.7 and 4.3 m, respectively. Samples from several millimetres to several tens of centimetres in diameter can be placed at the sample position. The beam size can be varied from 4 (pinhole collimation mode) to 40 mm in diameter (focusing mode). The scattered neutrons are detected by a 256x256 pixel two-dimensional position sensitive detector (of 0.7x0.7 mm2 pixel size) filled with 3He-CF4 gas mixture. Data acquisition is performed in event recording ("LIST"-) mode. Figure 2 displays an example of a small angle scattering measurement. Data were collected on both the FSANS and the SANS-YS instruments. Figure 2. Small angle scattering curve measured on pottery control samples on the FSANS (left side) and Yellow Submarine (right side) instruments.